We haven’t shared every single boondocking campsite that we have stayed at on this trip, simply because some of them are really not worth sharing. Those are the ones we typically only stay at for a night before moving to something better. On our drive through from Capitol Reef National Park toward Bryce Canyon National Park, we stopped about halfway in a town called Escalante. We stayed inside the Grand Staircase-Escalante National Monument on BLM land. It was a great campsite for boondocking in Escalante Utah! Where Is This Boondocking Campsite in Escalante? There are actually several dispersed camping spots that we heard about in Escalante and in Grand Staircase-Escalante National Monument. But the one we chose was right off of Hole in the Rock Road, about five miles east of the town of Escalante. The site was south on that road about a quarter mile, and there were tons of campsites in the area. They were well dispersed, so we didn’t feel like we were on top of another campsite, which is always nice. How Are the Roads at this Campsite? Hole in the Rock Road is a gravel, maintained road for the first few miles. So getting to this campsite was pretty easy. The campground area roads are more washed out, but with some strategic driving, it is passable in a large motorhome, at least to the first ten or so campsites. There are some campsites that go further down the road, but the road gets more washed out, so we did not go that way. We have taken more to unhooking Daypack, our tow car, whenever we are getting close to a boondocking campsite. First, we park Backpack (the motorhome) and take Daypack to scout the area so we can ensure the roads are passable and wide enough for Backpack. Once we find a good spot, Nate takes Backpack and Steph drives Daypack to the campsite. This way, we are not dragging a tow car along washed out roads. Whereas they have all been passable for both vehicles, it’s easier to maneuver each of them independently to ensure we don’t accidentally hit a rock with Daypack that Backpack easily cleared. It’s generally better for everyone! What About the Boondocking Scenery? A big part of boondocking for us is that the scenery is so much more beautiful than an RV park. So we tend to seek out campsites that have beautiful scenery all around. Boondocking in Escalante was no different! This particular campsite was in a wide-open pasture area with sage bushes and smaller evergreen trees all around. And lots of cactus, so watch those feet! But the views were gorgeous there! We were able to let the dogs run around and took them on hikes just around the campsite and through the pasture. They really enjoyed that! Anything Else to Note for Boondocking in Escalante? First off, you DO need a permit to camp here. It’s a free permit, but they just need to know how long you are staying. You can get a permit at the Visitor’s Center in Escalante, which we highly recommend visiting anyway! It’s a huge multi-division building that has information galore! They also have a fresh-water spigot outside, so if you need to fill drinking water jugs, there is the place to do it. It’s the BLM office as well as the office for the National Monument, and they are very knowledgeable about the area. We were able to get maps and tips and tons of recommendations on where to go and what to do. Since you have to go anyway, you might as well get some info while you are there! Another great adventure! We love to follow you since we both have the same “definition” of boondocking! 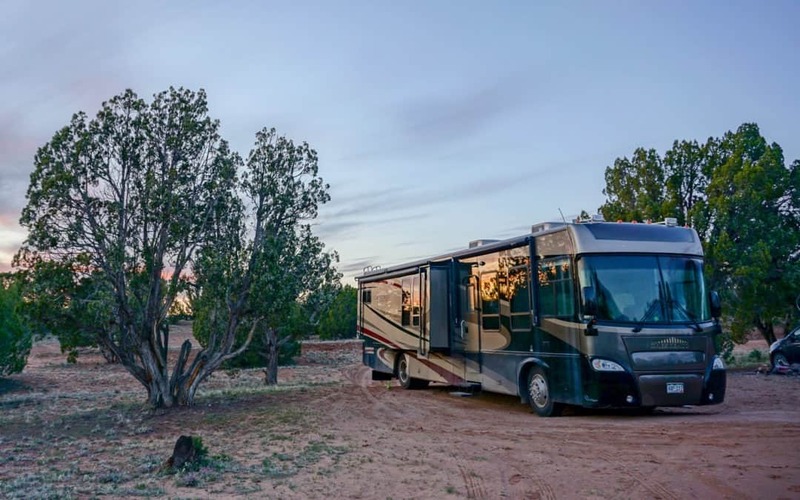 We consider Utah one of the best states for amazing boondocking options! You can always find something different around the corner! Thanks for sharing your adventures! Happy boondocking! Hi! Ran across your blog while researching boondocking off Hole-in-the-Rock road. Thanks for the great info! Also, congrats on your ‘new’ Sprinter van conversion. Read your ‘why’ post and agree on all points. We travel in a Winnebago View (only slightly bigger and not DIY). In 9 months of travel, we wished we had a toad only once and backed away from a dirt road only once. If we can’t get to a trailhead with the View, we’ve been able to get close enough to bike to it. Perhaps we’ll meet on the trail once you’re back on the road. Good luck and enjoy the project! Glad to hear you enjoy your Winnebago! The smaller definitely is better (so far) and alleviates a LOT of stress on finding a campsite. Did you end up finding a good campsite off Hole-in-the-Rock Road?